Electricity from renewable sources accounts for approximately one third of the power supplied in Germany. The government aims to raise this to 65% by 2030 and to 80% by 2050. The challenge is that wind and solar radiation are intermittent, so storage capabilities are needed. Further, “sector integration” is vital to also decarbonize other sectors, and energy needs to be transported from the sources to the users. The energy carrier hydrogen is the key element to solving these three challenges. It can be made by from water and renewable power by “electrolysis”, and it can simply be stored, transported and used – not only as a fuel for vehicles and to make heat and power, but also as a building block for green industry. E.g. in a fuel cell, hydrogen can be converted directly and highly efficiently into electric power, allowing zero emission mobility on roads, railway and water. 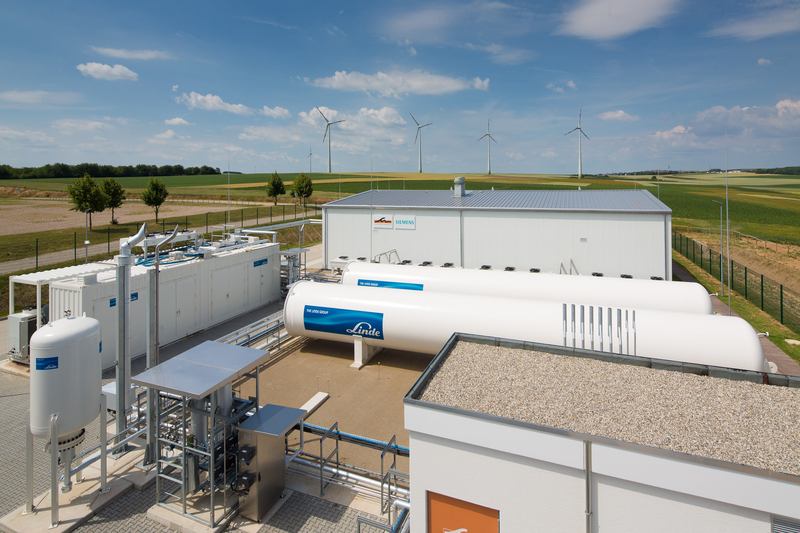 Energiepark Mainz, operated by Stadtwerke Mainz and Linde and co-financed by the Federal Ministry of Economic Affairs and Energy in Germany, was launched to investigate and demonstrate large-scale hydrogen production from renewable energy for a variety of use cases. A 6 MW Proton Exchange Membrane (PEM) electrolysis made by Siemens has been brought to full-scale proof-of-concept at Energiepark. It is connected to a wind farm in the direct vicinity, which is sufficient to compensate for capacity shortages in the distribution grid. Energiepark Mainz vividly demonstrates the potential of hydrogen as an energy vector. The electrolysers can be switched on and off or ramped up and down within seconds to take up excess energy and stabilize the grid. The hydrogen produced can be stored and either converted back to electricity later, or used for other purposes like mobility, heating or as an industrial feedstock. The Energiepark constitutes the world’s first multi-Megawatt PEM electrolyser installation; previously the technology had been used at much smaller scale, e.g. at hydrogen fuelling stations. In May 2018 it is still the world’s largest system by peak capacity. In the future similar plants could work in various locations to stabilize the grid and augment the energy transition by sector integration. To achieve this the concept needs to reach economic viability; for that, energy regulation and political support should be tailored accordingly. In addition, the production, storage and distribution of hydrogen should be standardised, electrolysers capabilities further improved and extended hydrogen applications actively developed and pushed.